I am an absolute mascara fiend and it is one of the items in my makeup bag I wear every day. The Lancôme Monsieur Big Mascara is new to my stash and is the very first mascara from Lancôme that I have tried. As much as I love my mascaras, I am quite picky. I like a mascara that if it claims to be volumising then that is what I expect. I don't like overly wet formulas and I don't like spider lashes, I like the natural look and don't want to spend hours scrubbing my eyes to remove all trace of mascara. The first thing to note about the Monsieur Big Mascara is the brush. The bristles are made up of soft fibres which claim to not only "hug your lashes" but to also separate and coat every single lash to give that lifted look of your lashes. The ultra-creamy formula has supple waxes and polymers to adhere immediately to your lashes to give you that big, buildable volume and length. Then there is the wand, it is huge and the name Monsieur Big Mascara most definitely lives up to its name right there. 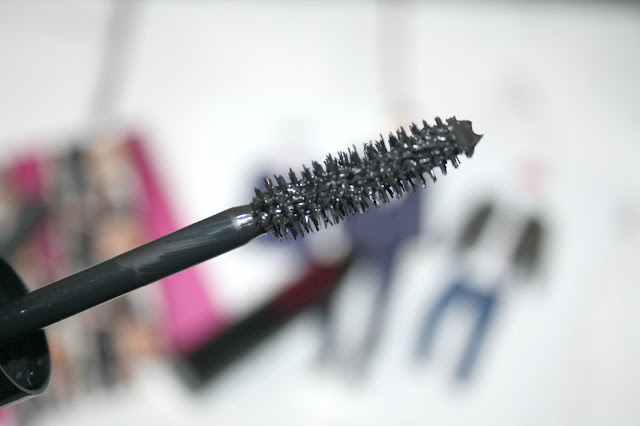 I like a big wand and brush, I like to feel the bristles work through my lashes as I zigzag it through from root to tip and I absolutely love this mascara - there I've said it. The bristles on the brush are incredibly flexible and they bend and move accordingly through your lashes and they coat every single one, even the teeny tiny ones right in the corner and i've also not poked myself in the eye as yet! I like how volumising this mascara is and thankfully it isn't clumpy, one thing that I really dislike in a mascara is clumping after one or two coats, with this mascara my lashes are defined and fluttery as well as not being over the top spidery looking, instead they are more natural. I have worn this mascara every day and even in the heat of what is now the UK's version of Summer, the mascara hasn't smudged or flaked and I definitely haven't had crispy looking lashes. The tube contains a generous 10ml of product whereas other mascaras that I use contain anything from 6.5ml 50 8.5ml and are within a similar price bracket. A full sized Monsieur Big retails for £21 and there is also a mini version of this Mascara available from Boots for £12 HERE. I would love to know if you’ve tried the new Monsieur Big Mascara? I absolutely love this mascara! It does amazing things for my lashes. The volume it gives is unreal. Lancôme are killing it right now!!! I have not tried this but my best friend is raving about it right now! Sounds brilliant!! I've been seing so much about this mascara! It looks awesome. I really want to try this! I keep seeing it in store and I know I need to get my hands on it soon! I love the look of the wand. I am super fussy when it comes to mascara's. I've been using this for a few weeks and I've not reached for anything else! This totally doesn't look like a Lancome Mascara but it looks amazing! I've heard so many great things about this mascara, I really want to try it!